The latest release from Craig Sheppard brings us a disc of Brahms, recorded, as is his wont, at live performances in Seattle’s Meany Theater. I understand that the performances preserved here were part of a larger series of concerts entitled Mostly Brahms. At these concerts, given between November 2010 and November 2013, Sheppard played most of Brahms’ solo piano music and several Schumann pieces. I mention this because if the microphones were live throughout these concerts then there may be the prospect of more to come. Between 2012 and 2017 I heard and greatly admired the six-disc survey by Barry Douglas of the complete Brahms solo piano music. However, an irritating feature of that series was that Douglas divided various sets of pieces between discs – so, for example, even the three Intermezzi that constitute Op. 117 were split across three different discs. 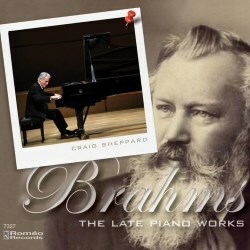 Here, Craig Sheppard has chosen to group together all the pieces in Brahms’ last four sets of solo piano pieces and that seems to me to be infinitely more satisfactory. Op. 116 comprises seven pieces entitled either ‘Capriccio’ or ‘Intermezzo’. The opening Capriccio is marked Presto energico and Sheppard’s playing is indeed energetic. The off-beat writing gives the music an unstable feel and that comes across well. The second piece is one of four Intermezzi in the set and here we encounter something which, happily, will be a recurring feature of the whole programme: Craig Sheppard’s very idiomatic and effective use of rubato in slow music. In the central Non troppo presto section of this piece I love the delicacy that he brings to the music, investing it with fragility. The rippling, urgent passion of the outer sections of the second Capriccio (Op. 116/3) is expertly delivered. Then we come to Op. 116/4, an Intermezzo which Sheppard describes in his notes as the “undisputed gem of the set”. Once again, his rubato gives life to the music and his introspective approach seems to me to suit the music to a tee. I’m interested in his description of Op. 116/6 as a “conversation, perhaps between two lovers”. His subtle voicing of the music does indeed give it a conversational aspect. Finally, he really delivers the surging turbulence of the concluding Capriccio; what a lot Brahms packs into the short time span of this piece. Op. 117 begins with a pensive lullaby. Sheppard plays it with great delicacy and feeling He makes the central section, marked Più adagio, very inward; hereabouts the refined sensibility of his playing is a particular delight. His way with Op. 117/2 is no less refined. His imaginative playing imparts a sense of fantasy which really brings the music to life. In Op. 117/3, I really relished the veiled sotto voce playing in the outer sections. The first piece in Op. 118 is an Intermezzo. Here the music is impassioned and has an unstable feel to it. Sheppard moves without a pause into Op. 118/2 and though this too is called an Intermezzo the music could scarcely be more different. This is one of my favourites among all Brahms’ piano music and I was delighted to encounter it here in such an expressive performance, the music enriched by wonderful rubato. The rubato seems entirely spontaneous but I’m sure that it’s the product of deep thought about the piece. This is an exquisite little gem, exquisitely performed. Sheppard describes Op. 118/3, a Ballade, as “feisty”. I don’t know if Brahms had any story in mind or whether the title of the piece was simply generic but as I listened to this performance I felt that Craig Sheppard was presenting the music with a narrative thread running through it. The outer sections of Op. 118/5, a Romanze, are allowed to unfold with simple dignity. The central episode is marked Allegretto grazioso and Sheppard here gives the music a lovely delicate flow, making it sound almost Chopin-esque. In the final piece, another Intermezzo, the atmospheric opening sounds really mysterious in this performance – what a touch! I was fascinated by Craig Sheppard’s comparison of the more dramatic middle section to Mahler’s Wo die schöne Trompeten blasen. I’d never thought of that, but I think the point is well made. The Intermezzo with which Op. 119 begins is truly intimate in this performance. Even when the music very occasionally and briefly attains forte the music still seems confiding. Sheppard’s account of Op. 119/3 has a cheerful lightness of touch, as befits this happy little piece. Op. 119/4 has bluff, outgoing passages either side of a more thoughtful middle section and Sheppard responds to the various moods of the piece very acutely. This is a deeply satisfying, insightful Brahms collection. Craig Sheppard’s empathy with the music is never in doubt and throughout the programme he plays with great imagination. His complete understanding of the music is apparent not only in his playing but also in his thoughtful notes. The performances were given on Steinway pianos – Mr Sheppard’s own instrument for Opp 116 and 117 and the Meany Theater’s piano for Opp 118 and 119. Both instruments have been recorded very successfully by the engineers, Dmitriy and Alexander Lipay - from memory they’ve been responsible for at least some of Sheppard’s previous releases on the Roméo label. Though the performances were given live I couldn’t detect any audience noise and there’s no applause at the end of any of the sets of pieces. I enjoyed this rewarding disc very much. The possibility that there might be more Brahms – and Schumann, too – ‘in the can’ from these concerts is a tantalising one. If that’s the case then I hope very much that it may be possible to release some of those performances in the future.